Savannah never disappoints. No matter how many times I visit, it seems as though there is always something I neglected to explore on my previous trip. 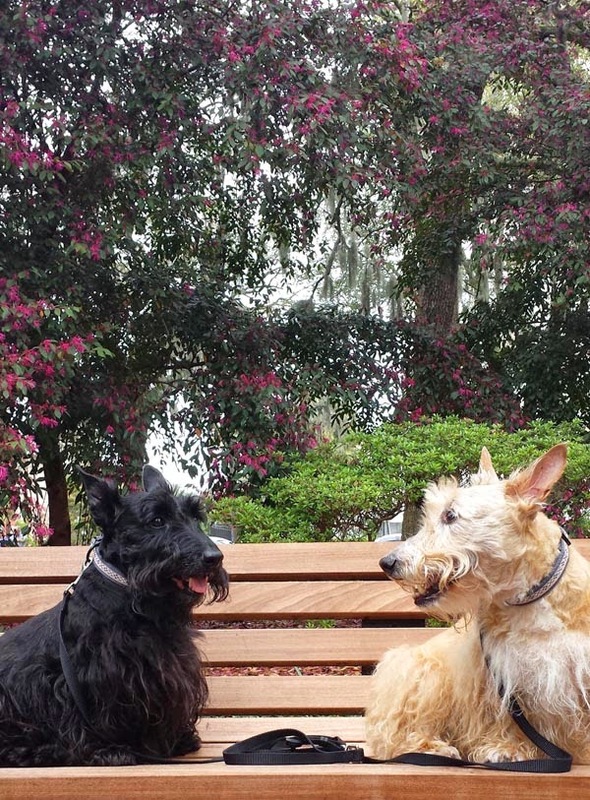 This time, I was excited to see how the city would handle Heather and Mr. K's Scottie-tude. After all, they are no strangers to taking pet-friendly vacations! We spent a half day just roaming the streets of Savannah - from River Street all the way through the historic district (where we saw another couple exchanging vows on one of the squares!). I was impressed by the number of places along the way that left water bowls out for the doggie passers-by and a few shops even welcomed four-legged friends. It was apparent Heather and Mr. K appreciated the sights, sounds and smells around them as well...but more on that to follow in the coming days. Today's post about Savannah is for the human vacationers! First things first: the food. On Friday morning, we ventured over to Goose Feathers Café. Scottie Dad ordered a chicken salad sandwich and I chose a chicken bacon mushroom melt. Scottie Dad thoroughly enjoyed his dish (he even finished it off with some bread pudding) and I was so hungry that morning that I honestly can't remember eating the sandwich. Much like Heather Beather and her meals, my melt was there one minute and gone the next! Plus, I was distracted by all the adorable dogs that walked by...including the service dog that came into Goose Feathers with his owner. Dinner was at a place on River Street called Spanky's, which is said to be the home of the original chicken finger. So, you can imagine what I ordered there! After we left Spanky's, we hopped onto an Old Town Trolley Ghost Tour and endured a very animated account of Savannah's history, legends and old tales. Because it had drizzled, plastic coverings had been placed over the open windows which fogged up too easily and made it impossible to see any of the sights our overly dramatic tour guide discussed. We got off at a few stops, the last one being the most theatrical and the icing on a particularly bad and overbaked cake. I'm not saying you shouldn't try it out - just that it wasn't my cup of tea. On previous trips, I have taken one other ghost tour that stopped at the Pirate House. While I cannot recall the name of the tour, I do remember that one being a bit less hokey and actually quite enjoyable. Saturday morning, we had one of the best brunch experiences ever with Heather and Mr. K before setting out again on a walk around town. 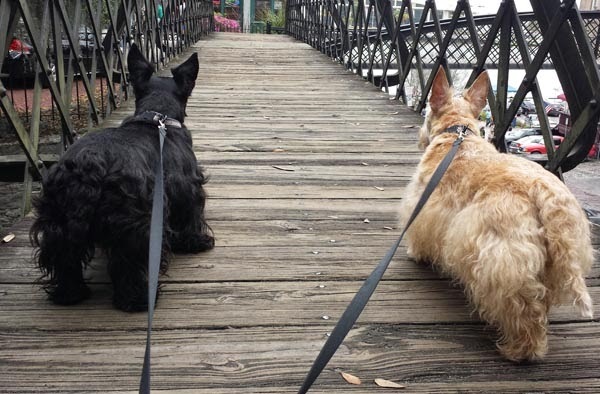 You can read all about the Scotties' brunch experience in tomorrow's post but let me leave you with this: while we certainly wished we had more time to stay and experience Savannah, Heather and Mr. K give this place two paws up! Oh, and in case you were wondering how the Fluffy Guy comedy show was...Scottie Dad and I couldn't have been more pleased. We have seen Gabriel Iglesias twice now and each show has been well worth the money spent on tickets. The content is fresh and, of course, funny. It is so obvious Gabriel Iglesias cares about putting on a good show and making sure everyone has a good time. He often unplugs the clock on stage and performs for at least an extra hour or more! What a fun dog-cation! I bet you had the best puppy dreams while you were there! Savannah looks and sounds pawsome!! Makes me want to take my girls to Savannah! Hmmm, roadtrip! LOL Thank you for the awesome pics. It's one of mom's dreams to do the ghost tour, I bet it was abolutely spookylishious! Have a great friday and a super weekend! After H&K got through with it, is Savannah still standing? Savannah oh how I envy you going to Savannah. I was just looking over the menus of the places you ate and compared to Cincinnati they are quite reasonable. Strange but I would like touring some of the cemeteries. So nice that the four of you had fun. That is one city I've thought I should visit. It sounds a fabulous place to visit and I bet there are some very interesting historic places to see and stories that go with them. We would so love to visit Savannah. Have a fabulous Friday. Never been to Savannah...or Georgia for that matter. Looks like something that should be added to the list. Thanks for the tour. Wow, sounds like a wonderful trip! What hotel did you stay at? Most of the dog-friendly hotels I've found won't allow Chewie because she's over the 'weight limit'. Talk about giving a girl a complex! Sounds like an awesome time! The food is making me hungry right now :) I've never been to Savannah before but it sounds like a nice place to visit. Oh it sounds like you all had the best time! Love all of the photos too! What a wonderful place...thanks for taking us along! My people went there once & they loved it!